There has been a force of gravity between Indian classical music and jazz for many decades–the push and pull of improvisation, the exciting rhythmic language. Founded in 2014, the Trio Benares continues on this path of tradition. As part of a seventh generation musical family, sitar player Deobrat Mishra has reached a prominent place amongst his peers. In collaboration with his nephew Prashant Mishra, a rising star among Indian tabla players, he forms a perfect unit. Roger Hanschel, surely one of the most extravagant, multifaceted saxophone players and composers of contemporary jazz, communes with the sensual and brilliant sound of Deobrat Mishra’s sitar. In turn, Hanschel’s rhythmic finesse finds its equivalent in the virtuosic tabla playing of Prashant Mishra. While steeped in tradition, Trio Benares brings a freshness to both musical styles. “In his new band, Roger Hanschel seeks an encounter with North Indian classical music. 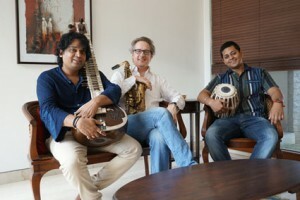 His trio Benares plays with a temperament and a virtuosity that can rip a listener out of his or her seat. „Sri Aurobindo Auditorium in Bharat Nivas, Pavilion of India in International Zone was crowded with music lovers who longed for something more. 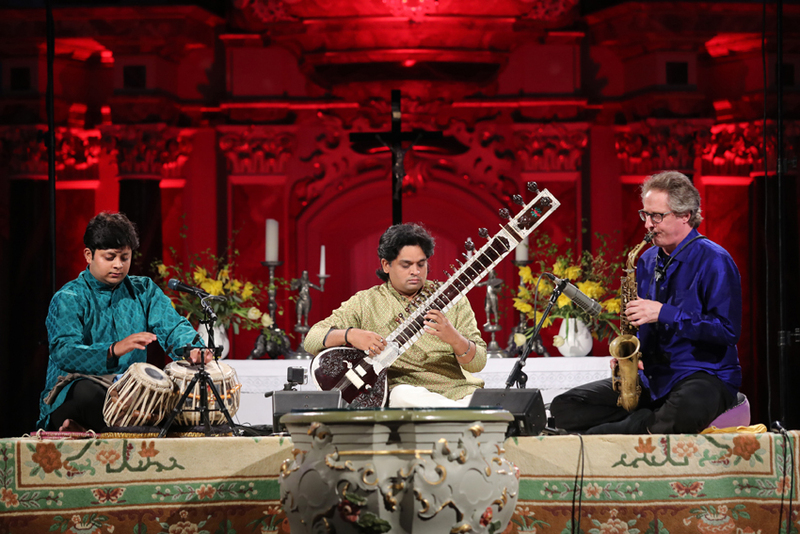 Although the title World Music Concert had promised maybe a bit more than a classical Indian music, what we got was a big surprise- an exciting fusion of Western European jazz saxophone with sitar and tabla. Born in 1976, he represents the 11th generation of the Benares Gharana tradition. of the well -known tabla player Pandit Baiju Mishra of Benares. He started by studying vocal music with his father at the age of five and began his sitar lessons a year later. on stage. Five years later, he performed for the first time on the All India Radio. Since 1994 he has been touring throughout Europe with his father. In the same year he was chosen to receive the award of the best young sitar player of India by Youth Festival. the school he founded along with his father, Pandit Shivnath Mishra, in 2006. In 2010 Deobrat Mishra played with Indian musician in Denmark for Global Voices of percussion. Musicians from all over the world performed and Deobrat Mishra represent Indian music in this festival. India. Total musicians where 151 including Tabla and Flute players. Music was created by Pandit Shivnath Mishra. Symphony Orchestra of Italy in 2005. Nowadays, they fully dedicate their art to similar projects including annual tours around the world. (Student of Great Tabla player Anokhelal Mishra. uncle Deobrat Mishra he was able to perform with Mishras his skills beautifully compliment and support the Mishras in their concerts and travel around the world with them. In 2004 he won first prize in Tabla competition organized by Sangeet Natak Academy Uttar Pradesh India.He received many awards for his tabla playing at many different places.